Good Morning Friends! 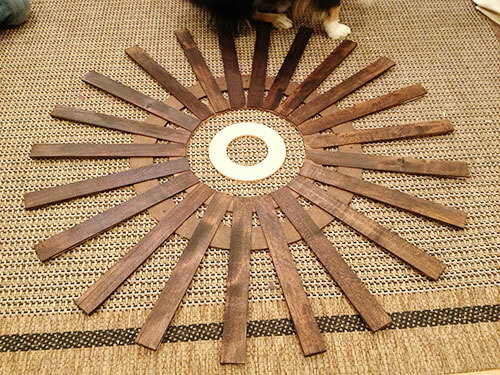 This is the 2nd project in my 52/52 Challenge….a DIY Sunburst Mirror. Want to know a little more about my Challenge? Check it here. First off, I’d like to say that this room used to be called the ‘hate room’. no joke. The last serveral years I’ve tried and tried to decorate this room to my liking but sadly, my attempts were NEVER successful. I won’t go into details because it involves a throw-away party of almost all furnishings into a dumpster ( seriously, we had my desk and bookcases left in the room, it was a sad/hate room.) and it would take a lot of therapy and chocolate. Moving on…. So, to make this room inviting and to keep my neighbors from thinking we had to sell our furniture, I painted the walls ( I went white) and bought a couch. Well, to be honest, it was because My Man put his foot down and said to do something about it or he’d put up wallpaper with wolves on it. He really does know how to motivate. NO WOLVES! Now that I have the whitish couch I’ve always wanted (that I got for dirt cheap) I needed something above the couch that was dark and would provide contrast. 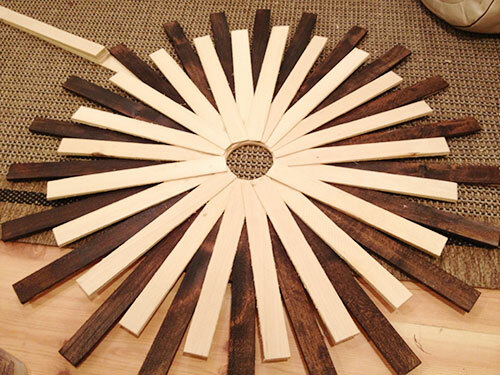 I decided on a dark sunburst mirror like Alicia’s @ Thrifty and Chic. Instead of doing all the cutting and measuring, cuz I’m kinda lazy, I went with wall shims. They are super cheap and super easy to glue on floral rings with a glue gun. Told ya, lazy! I started by laying all the pieces out to see what it would look like. I left for a sec and look what my pup did….I guess she didn’t like it the way I set it out. Isn’t she cute?! 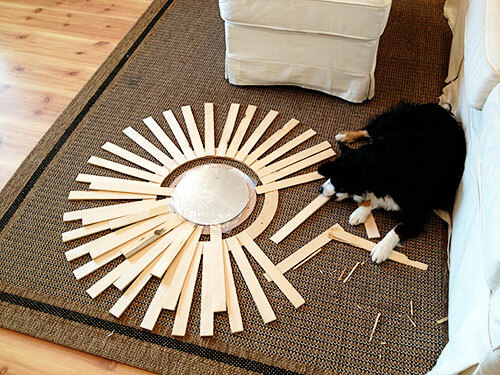 Once I knew what the plan was I glued the 1st layer on and had my trusty helper (one of my boys) stain the shims. Once it was dry, I added another layer. I kinda liked it this way but I didn’t want to go too crazy. ha! I let that layer dry and added the mirror. I hung it as soon as I could without staining my newly painted walls. Doesn’t it look great!? I was admiring it when the blasted mirror fell off behind the couch. I guess I didn’t use enough glue. I love the contrast and I love the white. I still have lots of work to do in this room but this is a good start. 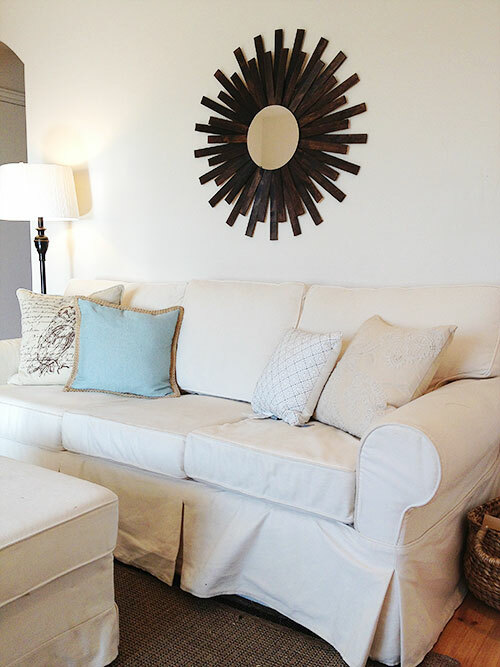 Couch + Ottoman $300 – classifieds/Pottery Barn/extra tan slipcover ..SCORE! Pillows $45 – i used the small one on my bench instead of here. What do you think? I think I love it and can’t wait for this room to be a ‘great room’ not a ‘hate room’. See ya tomorrow! What a neat idea. I love your shim idea–short-cuts are always appreciated! Your room is looking great! Very clean and peaceful. Thank You! I love short cuts! fabulous! especially with your white couch! awesome! You did a great job with this mirror! The slats came out so perfectly and evenly. I wish I was that crafty, but I know I’d be dangerous with a glue gun. Also thanks for your comment on my ring illustration. I guess I should post more photos, since there isn’t time to paint everything! Thanks Sabina! I love your ring illustration, so pretty!